We offer some of the best customer service among roofing companies in the Angus area and a 10-year warranty on workmanship, too! When we first began Slippery Slope Roofing, we looked around at other roofing companies in the Angus, Ontario area, so we could get an understanding of what was being offered and how we could offer even more. One thing that we learned was that one thing was often missing – great customer service. It was like most roofing companies figured you just expected them to be gruff, inattentive, and messy, so it was fine to be that way. We don’t agree. You will find our interactions to always be friendly, personable, and professional. When we are working on your roofing project, you have our complete attention. We even do just one job at a time to ensure this. By putting our entire team on your project, we can also assure you a clean worksite. We work hard to maintain the stellar reputation we have earned with 50 years of combined experience. We are fully insured with the WSIB and also accredited by the Better Business Bureau. You should never settle for roofing companies that don’t provide you the quality and attention you deserve. Give us a shot, and we are confident you will agree that we’re on to something here. Great customer service is alive and well because we’ve taken the stand that this is how it should be. 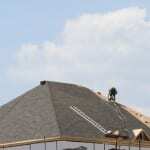 If you have a roofing issue at your home or business, we welcome your call. We offer a full line of roofing services, including installation, maintenance, repair, and replacement. We offer top-quality products to go with our quality workmanship. You’ll enjoy the warranties from IKO, BP or Owens Corning, as well as our 10-year warranty on our workmanship. That’s just one more thing that we do better than other roofing companies, so call us today, and let’s get your home protected from the weather as soon as possible.